Hungarian Prime Minister Viktor Orbán said his country has a “major problem” with Brussels because of the European Commission’s plans to set up an Energy Union, which in his words hinders national sovereignty. Orbán, who two days ago hosted Russian President Vladimir Putin from whom he obtained major gas price discounts, said his country does not agree that he must inform the Commission of his gas supply agreements with Russia. One of the key elements of the Energy Union is that member states’ energy deals with non-EU nations should be scrutinised by the European Commission before they are signed. Russia has always insisted that those deals are confidential. Orbán himself said that Hungary now receives Russian gas at $260 per 1,000 cubic meters, down from $500 in 2009. Also, Russia abandoned demands that Hungary should pay for unused gas under a “take or pay” clause. The Hungarian Prime Minister also made it clear that Hungary would no longer reverse Russian gas to Ukraine. In recent months Poland, Hungary and Slovakia have reversed Russian gas, which those countries buy at lower price than Kyiv, back to Ukraine from where this gas has transited. The EU is supporting the initiative and helps finance the equipment which makes reverse flows possible. “We have to promise [Moscow] that Russian gas won’t get in the pipeline under a reverse flow to Ukraine,” Orbán said, according to the Wall Street Journal. “Ukraine makes a political issue out of this, but this is a price issue,” Orbán added. One of the big priorities of the Juncker Commission is to achieve an Energy Union by connecting infrastructures, enforcing legislation and increasing competition to help drive down costs for citizens and businesses and boost growth. As means to achieve the Energy Union, it is envisaged that the EU will diversify its energy sources, will combine infrastructures and unite its negotiating power vis-à-vis third countries. The EU also aims at making Europe the number one in renewable energy. The Commission foresees that future intergovernmental agreements (IGA’s) of member states, as well as “other type of contracts” with gas exporting countries would be subject to prior scrutiny to make sure EU internal market rules and security of supply criteria are observed. In December 2013, the Commission disclosed that the bilateral agreements for the construction of the Gazprom-favoured South Stream gas pipeline – concluded between Russia, Bulgaria, Serbia, Hungary, Greece, Slovenia, Croatia and Austria – are all in breach of EU law and need to be renegotiated from scratch. Russia is playing a corrupt piece of complice with Russia ! My analysis is that Hungary has dealed for the $260 per 1,000 cubic meters in exchange for Kiev to get banned from gas (from gas reverse)! 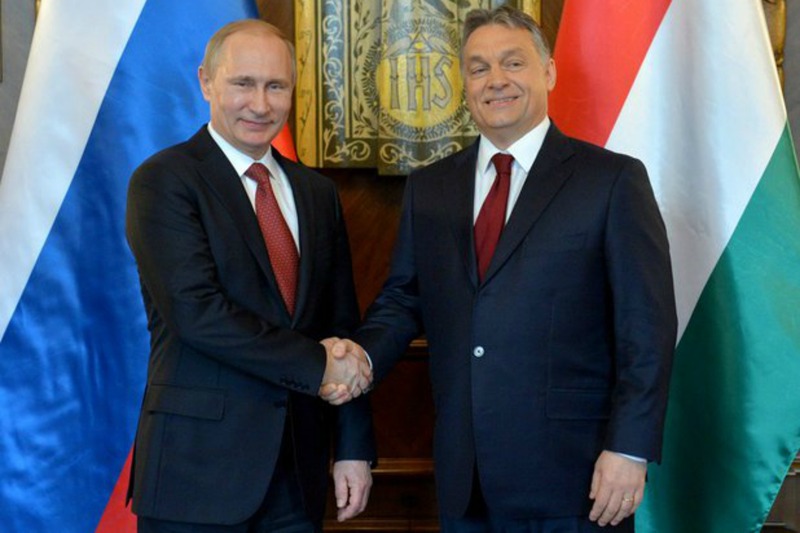 What a corrupt face Orbán & Putin have . This is an excellent deal for Hungary and yes corruption is a major issue in Russia as well as in China, Indonesia, India and Brazil. Yet, commercial deals are being made between them and US, Germany, France etc. But no one ever blames these Western countries for doing business with the BRICS. It is Hungary’s national interest to have cheaper energy that will make several industries more competitive working in Hungary. It is a betrayal to all Hungarians that had to leave the country for the Russians in 1948 and 1956 when many of them died trying to liberate themselves from totalitarians such as Putin. The best is not to invest in that country anymore. Trust in people is a base to do business. Orbans politicians and public authorities that are needed for business can not be trusted.